Macquarie’s leading family. One of our oldest and most prepotent families. Characteristics are early maturing…..deep wide bodies with deep wide twists and shorter in the leg while carrying a well nourished 64s, long staple fleece. 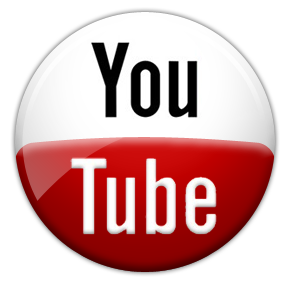 Sires have sold for $16,000 – MD010031 (Australian record price at auction National Sale 2002) to Uardry and Hendrick Dohne Studs, $15000 – MD041440 (Victorian record for a dohne) to Havelock Park and impact sire MD070583 to Chirniminup Stud, WA for $6500. 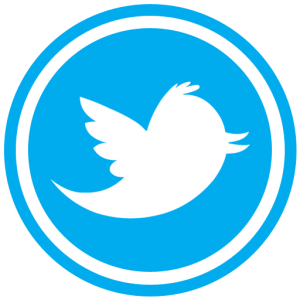 MD070424 to Koonik Stud, Vic for $6000, MD088527 to Kardinia Stud for $4500, MD092424 to Havelock Park for $7000 & MD103737 to Barnadown Dohne Stud for $5200. 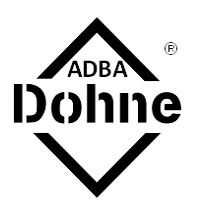 At the 2016 Australian Sheep & Wool Show at Bendigo VIC, was the first time Dohnes have been shown in Australia. 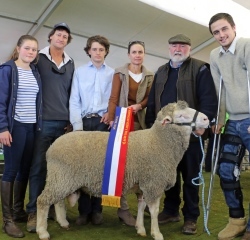 1051 took out the supreme exhibit at the 2016 Australian Sheep & Wool Show, emerging from a strong class of 29 senior ram entries to be sashed as senior, grand and supreme champion. Sired by MD103467 and out of Majestic Dam, 1051 is a long bodied, true to type Dohne sire with an excellent top line and twist. He stands well and has a soft masculine muzzle which is free of blemishes. 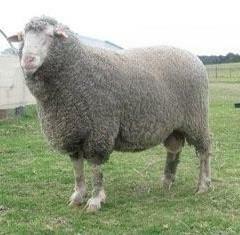 MD125277 Sire MD09-2488 out of an Majestic family ewe. 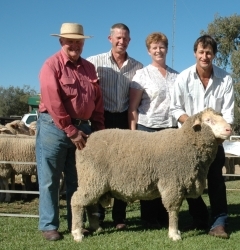 With the highest Dohne Index Value in the 2014 catalogue of 150.74 the outstanding s sire out of Macquarie’s leading sire family, the Majestic family, also topped the catalogue for clean fleece weight at 24.68 and was described as being ‘square and correct with beautiful nourished wool’. 5277 sold at the On Property Ram Sale 2014 for $4,400. 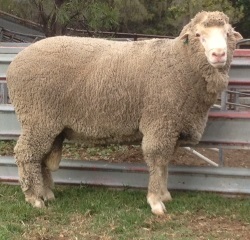 Purchased by Stephen & Dianne Perry ‘Wyndabyne’, Warren. MD114927 “Majestic Family” Sire GLN080169 out of Uardry blood ewe. 4927 is a deep bodied sire carrying a quality long stapled medium fleece & is free of any blemishes. MD “Majestic” 114475 x MD09-2424 out of an Olympus family ewe. 4475 is an upstanding sire with excellent length of body & conformation. 4475 carries a long stapled medium fleece on a thick supple skin & is free of any blemishes. MD103737 sold at the 2012 Victorian Sale for $5720. Purchased by Barnadown Dohne Stud Epsom, VIC. 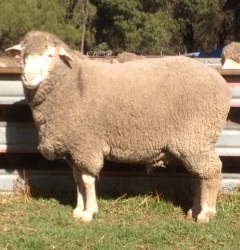 3737 ‘Majestic’ x MD07-583 out of a Colossus Special Stud Ewe. 3737 is by impact sire 583, Australia’s leading sire for eye muscle, and shows all the attributes of his sire; deep body, good top line and plenty of width & depth in the twist. 3737 stands squarely & is free of any blemishes. Family sires have sold to $15,000. 3467 x Majestic 7-583 out of a Olympus 4-1792 Special Stud ewe. By Majestic 7-583, Australia’s leading sire for eye muscle EBV. 3467 encapsulates the positive traits from our two oldest & prepotent families. 7-583 has bred some great sires but 3467 is the best thus far. A long bodied, square, deep sire with an excellent twist, great conformation and is free of any blemishes. 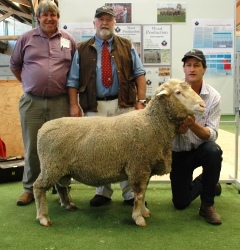 3467 is the true ‘all-rounder’, a great meat sheep with a +2.4 EBV for eye muscle, yet the finest actual fibre diameter of all our young sires at 16.9. 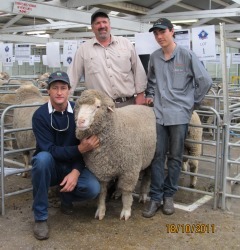 MD092424 sold at the Victorian Invitation Dohne Ram Sale 2011 for $7,000. Purchased by Havelock Park Dohne Stud Stratford, VIC. MD092424 Majestic x MD070424 out of a Majestic double stud ewe. MD092424 is a pure Majestic family sire.He has a long deep body with an excellent twist and top line. He carries long staple 66’s quality fleece and is free of blemishes. MD070583 sold at the Premier Dohne Stud Sire Sale 2011 for $6500. 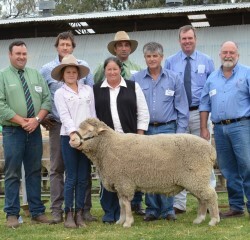 Purchased by Trenton & Rachel Browne Chirniminup Dohnes WA. 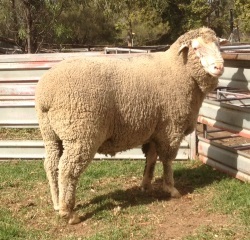 MD070583 another son of MD054177 out of a Colossus Special Stud ewe (by Colossus MD030912 sold to Midgery Dohne Stud). MD070583 is currently Australia’s number one sire for eye muscle. MD070583 is an early maturing sire with excellent width, depth and twist. He carries a rich medium/fine fleece and is free of any blemishes. 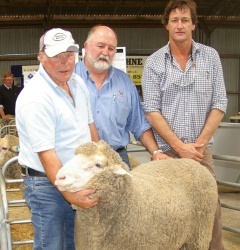 MD070424 “Majestic 4th” sold at the On Property Ram Sale 2009 for $6,000, purchased by Koonik Dohne Stud Nurcoung, VIC. 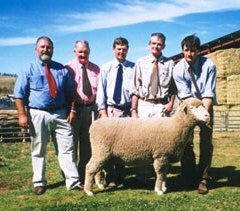 He is a son of outstanding sire 05-4177 Majestic 3rd out of a Colossus (long staple, medium wool family) special stud ewe. 424 is true to family type carrying an exceptionally long staple, shafty, 66’s quality fleece on a thick supple skin. He is a well-muscled sire with a deep, long body, excellent bone and conformation. 424 is free of any blemishes. Family sires have sold to $15,000. MD05-4177 is an exceptionally well-muscled sire with a deep, wide body and excellent bone and conformation. 4177 carries a shafty medium fleece on a thick supple skin. 4177 has no blemishes. MD04-1440 $15,000 highest priced Dohne ram ever sold in Victoria at the 2006 Australian Sheep & Wool Show Bendigo to Craig & Janet Robertson Havelock Park Dohne Stud, Stratford Victoria. MD04-1440 Majestic is a deep, long bodied, well-muscled sire with an excellent topline and conformation. He has a well-nourished, rich lustrous deep crimping fine/medium quality fleece carried on a thick supple skin. MD 01-0031 A grandson of 763 former No.1 ranked sire in South Africa. 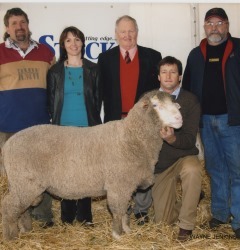 MD01-0031 sold for an Australian record price at auction for $16 000 to Uardry and Hendrick Dohne Studs at the 2002 National Sale.An extremely well-muscled sire with excellent confirmation and bone carrying a quality medium wool fleece.A son of MD01-0031 topped the Bendigo sale in July 2004, selling to David Mitchell of Bairnsdale for $3500.